I have been back walking my loops of the parish boundary (read why here and here). The other evening I rejoined the boundary at the medieval stone cross on the old road to Plymouth. The surface of the road has sunk down well below the level of the surrounding land, probably worn down by decades of cart wheels and feet. The pavement levitates a good few feet above the road itself, and runs along half way up an old Devon bank full of wild flowers and grasses. I can imagine the sense in it being raised up out of the mud and muck of the old road to aid pedestrians in a slightly drier passage. At the top of the hill I turned right and followed the ridge along a lane. This area was once home to two big quarries that provided most of the red bricks used for the local houses and buildings. Over to the left, fields straddle the ridge and then drop away into a deep wooded combe with a stream at the bottom. On the right is a housing estate with marvelous panoramic views of the whole city, and on a clear day, all the way to the sea. I take a right along the top of the housing estate to join the old holloway that runs down in a diagonal through the estate, eventually petering out behind some bungalows. I have a vague sense of unease about the way that holloway has been treated by the town planners. Anyone who has had a deep association with a holloway and has read Robert MacFarlane, Stanley Donwood, and Dan Richards’ book Holloway will know that these ancient routes have a personality and atmosphere all of their own. It reminds me of the river spirit that comes to the bathhouse in the Japanese animated film Spirited Away. Eventually they manage to clear all the rubbish and pollution (including an old bicycle) out of it and it flies away into the sky in a spray of sparkles. I wonder if this holloway has its own sort of genius loci, and will one day rise up with the buried rivers of London, wanting to know why it has been treated with so little respect. I go up the holloway rather than down it to the houses. It is deep and verdant, smelling of green and of growth and of rich dark earth. It borders a small Local Nature Reserve where Devon Wildlife Trust graze cattle. Rare yellow ants can be found here, along with common lizards and 23 different species of butterflies. At the top it joins a lane but this obviously must have been the route of the old holloway too because, although wider, it isn’t that much wider, and is hemmed in by those characteristic earthen walls. I find myself increasing my pace to a trot here. If a car came, there was literally nowhere for me to go. Thank goodness for my bright pink jacket! Lo and behold a car did come racing through, going so fast that the driver must have been a frequent user of the lane and not at all used to there being a walker on it. He screeched to slow down and I had to turn in my toes to let him pass. Recently I read someone commenting about how we don’t walk anymore. It was a child psychologist I think, saying how we don’t walk as families anymore. The comment sprang to my mind as I finally broke into a run towards the end of the lane. And I get it. There’s a nervousness about walking in rural areas. Although the path might be clearly marked as a right of way in books and on maps, my self-confidence in my right to be there easily crumples. I think England is deeply embued with a strong sense of private land ownership. It whispers to me that I’m not allowed here and I can’t do that. And even if I am allowed here I don’t know how to behave properly in the countryside. Even though I’m not at all, the charge of “townie” looms. Suddenly I’m grouped with all those people who fly-tip and leave beer bottles in field gates, and let their dog harass sheep. The image of a rifle-toting landowner shouting “get off my land” is quintessentially English. A little while ago, I listened to an episode from the Radio 4 archive of In Our Time about the poet John Clare. Poor John Clare ended his days in an asylum and it was fascinating to hear the experts discussing some of the possible causes for the deterioration of his mental health. The main bulk of the Enclosure Act was enforced in John Clare’s lifetime and they talked of the impact of this dislocation from the land he loved so dearly. We need our green spaces, and to be frank, parks just don’t cut it. We need green as far as the eye can see just as we need sea to the horizon, and stars filling the sky. It gives us perspective on our tiny lives. So I conjured up my old Grandpa Evans in my mind’s eye, complete with gaiters, waistcoat and enormous walking stick, stuck two fingers up to the word “townie” and strode on. I took another little lane heading down hill and followed a footpath over some fields. At last I emerged back on to another housing estate, and followed the sweep of surburbia down to the river, where a path took me all the way home. 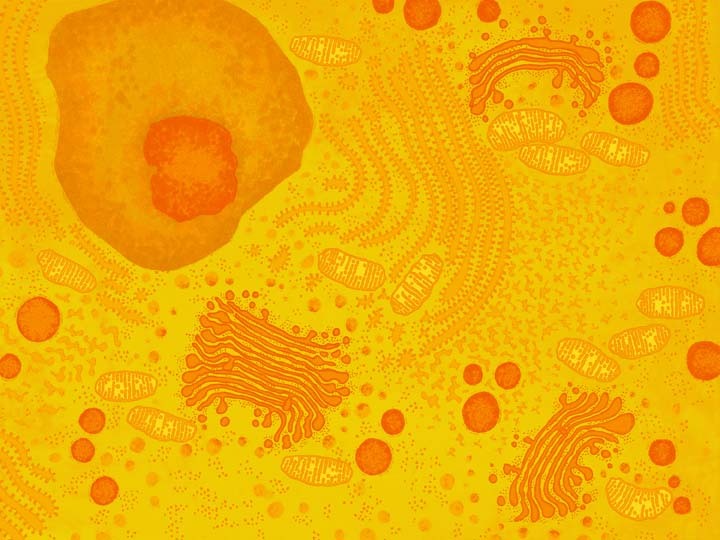 The illustration above is from a project I recently completed for Centre of the Cell about cells. Can you tell your rough Endoplasmic Reticulum from your smooth?!! This entry was posted in Countryside, Illustration, Wildlife and tagged animal cell, beating the bounds, biology, children, Dan Richards, Devon Wildlife Trust, Dove Grey Reader, education, enclosure act, exeter, golgi apparatus, green circle, green space, Hannah Foley, holloway, illustration, illustrator, John Clare, kids, Local Nature Reserve, lysosomes, natural history, nature, nucleus, orange, red, ribosomes, ridgeway, Robert MacFarlane, rough endoplasmic reticulum, science, smooth endoplasmic reticulum, Stanley Donwood, walking, yellow, yellow ants. Bookmark the permalink.